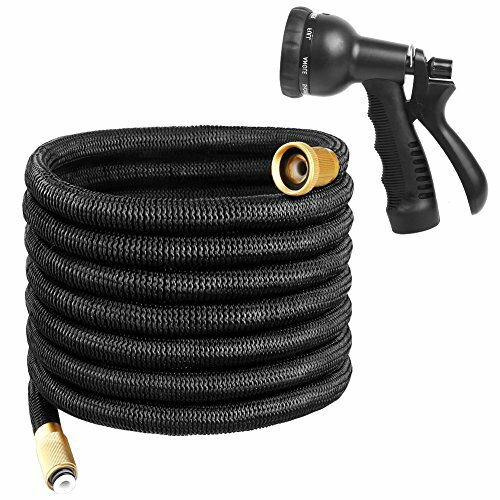 Are you tired of moving your heave hose to irrigate garden, wash car or clean your yard? Are you troubled by these things? plastic connectors to the brass fittings, the item is premium whatever in life usage or experience, higher than 90% of the other product on the market. It will definitely bring you an unprecedented experience in quality, safety and reliability. 3.Do not leave the water turned ON and the hose under pressure when not in use. 4.Drain the hose in the summer when you are not using it and keep it shaded as much as possible. 5.Store the hose in winter in the condition of draining the hose completely as water remaining can freeze, damaging the hose. to the quality and safety of products. and begin a convenient lifetime. EXPANDABLE WATER HOSE: The flexible hose starts out from 17 FT; when the water is turned on the hose quickly expands up to 3 times in length (50 FT), and restore in minutes when water has gone. Make your garden simple without having to work so hard. NO MORE LEAKS: Heavy duty hose with triple layer latex core & solid brass fittings, which can withstand water pressure up to 12 Bar. Not only ensures its service life, also keep you away from the hidden danger of pipe's burst. No more worries about leaks, tear or cracks! KINK FREE GARDEN HOSE: Using the extra-flexible material--high strength tough woven casing, it can efficiently protect latex pipe. The advanced design will never kink, tangle or twist. Help you get rid of all the obsession when using an polyester fabric or plastic pipe. FREE 8-IN-1 SPRAY NOZZLE: You can easily rotate the spray nozzle to choose various patterns including soaker, cone, angle, center, mist, shower, flat and full. Whether you need a high-pressure jet to clean a hard surface or a soft shower to wash your pets, shower on flowers, 8-in-1 water hose will get your job done. WHAT YOU GET: 1* Expandable hose, 1*Spray nozzle, 1*Storage bag. We're so confident in the quality of the garden hose, that we're proud to offer an unparalleled 2 YEARS REPLACEMENT GUARANTEE! If you met any problem, simply contact with us and we will provide a replacement or full refund without any doubt!